* Usually Ships within 7-10 Business Days. 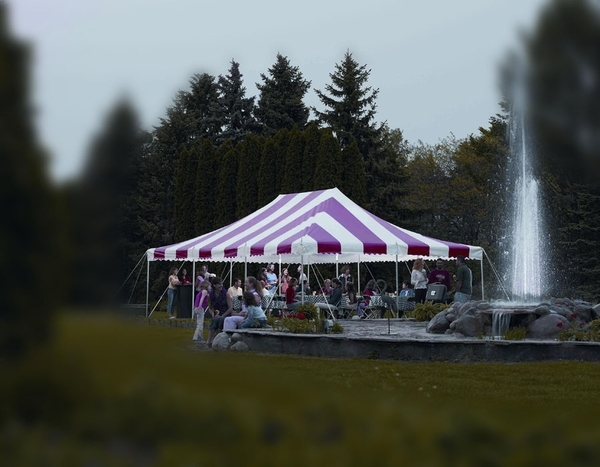 This Oval Eureka Traditional Party Canopy with Translucent Top covers a 30 Foot x 40 Foot area is a traditional style pole tent type canopy. This canopy features attached guy ropes as wells 'D' fittings and storm lines positioned at all center poles. The canopy provides around 1,200 square ft. of covered space and comes in the traditional vertical white and colored stripes reminiscent of old-fashioned circus days. The Eureka Traditional Party Canopy is reliably sturdy and durable with reinforced pole positions and a sturdy one-piece 11 ounce translucent vinyl top that resists fire as well as mildew. The canopy includes all necessary stakes and poles and can be easily installed by just two people.